As the second trim in the lineup, the Toyota Camry SE brings to the mix performance features like a sport-tuned suspension and paddle shifters, which offer Palm Coast drivers full control of their driving experience. 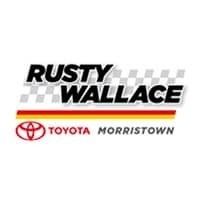 Come check out the Toyota Camry SE, along with the rest of the Toyota sedan lineup, at Rusty Wallace Toyota. Contact us today to schedule your test drive! The Toyota Camry, available in a wide variety of trim levels, finds no difficulty in beating out popular competitors like the Honda Accord by offering the more advanced Entune™ infotainment system, in addition to emergency telematics. Opt for the Toyota Camry SE and Morristown drivers can enjoy SofTex® leatherette upholstery and 17-inch alloy wheels for a look that’s sure to turn heads, both inside and out! Safety is no issue with the Toyota Camry SE considering it comes with Toyota Safety SenseTM (TSS).